WOW! This month just FLEW by! Or maybe it's because February is short a couple of days. Anyway, here we are with another brand new Stamp of the Month! This month the Stamp of the Month Blog Hoppers are showcasing Floral Happiness. The stamp is a great Base and Shape set that includes 16 stamps! If you have come here from Michelle John's blog you are on the right track! This hop is a big circle so if you are just starting, when you go all the way through and get back to me, you have completed the circle! I've got 3 cards to share with you today. The first card I created with a bit of Later Sk8r paper to show you that this paper doesn't have to be ALL BOY!! I used a sketch from Jeanette's How To Book- Originals (9036). (Now Available in Soft Cover for $14.95!) For this card I used Slate Cardstock as my base. I scuffed it up a bit with some sanding to blend with the 'rough' look of the Later Sk8r paper (X7167B). Next I 2nd generation stamped the base stamp of the rose with Lagoon and used Slate Ink for the Shade stamp. I used the same technique for the leafs - 2nd generation Slate for base and 1st generation Slate for the shade. 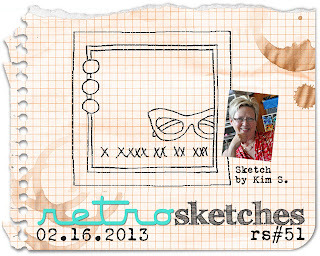 I used Slate Polka Dot Washi Tape (Z1817) in place of the cardstock strip on the sketch. I accented with Sparkles Clear Flourishes - Small (Z1812) and 2 adhesive backed lagoon resin flowers from For Always Assortment (Z1811). For my next card I used the For Always Paper (X7165B) and another sketch from the Originals book. The large square piece of For Always paper is folded up to show the underside of the paper. The button gives the impression that the piece is buttoned down. I used Ruby ink to stamp the roses using the 1st and 2nd generation stamping technique to stamp the base and shades. I used all three roses to cascade them across the card. I used another Sparkles Clear Flourishes - Small (Z1812). These fourishes are great for adding to cards! Also, if you look closely, you will see that I used the Black Shimmer Trim (Z1809) under my sentiment and also with my button. I love this adhesive backed trim as it is a great accent for the For Always paper. The button is from the new Black Button Assortment (Z1821). On my last card I decided to use the smallest rose shade stamp to create an elegant background. I used Honey Ink and stamped on the White Daisy Cardstock. I created a fan with Black Tulle Ribbon (Z1798) and added bitty black sparkles the edge of the tulle. I used the chipboard circle from inside of a frame from the Irresistibles Frames (Z1843). I added 2 Honey resin flower pins from the For Always Assortment (Z1811). On this card, I added a Black Sparkle Flourish (Z1745). The other sparkles on the card and tulle are from Sparkles Black and Grey Assortment (Z1754). Which card is your favorite? I would love to know! Remember you can get this set for just $5 with a $50 purchase! Ready to see more inspiring works of art with Floral Happiness? Hop on over to Elizabeth Mindemann's blog! Clean and Simple cards are actually a little difficult for me! I have to really hold myself back from adding lots of embellishments. I try though.... maybe one of these days I'll get the CLEAN and SIMPLE part down. Today's Heart 2 Heart Challenge is create a Clean and Simple Card, while over at CAS-ual Friday their challenge was to add a little bit of silver to a clean and simple card. So, I thought I'd might as well use the sketch from Clean and Simple Stamping and create something for all three! For this card I used a bit of paper from the Later Sk8r (X7167B) paper pack and some silver paper from the Black and Grey Glitter Paper (Z1829). I used the Artiste Cricut cartridge to cut a couple gears in the silver paper. I have to say, this glitter paper cuts like butter on my cricut! And, I really like that it doesn't leave glitter everywhere! 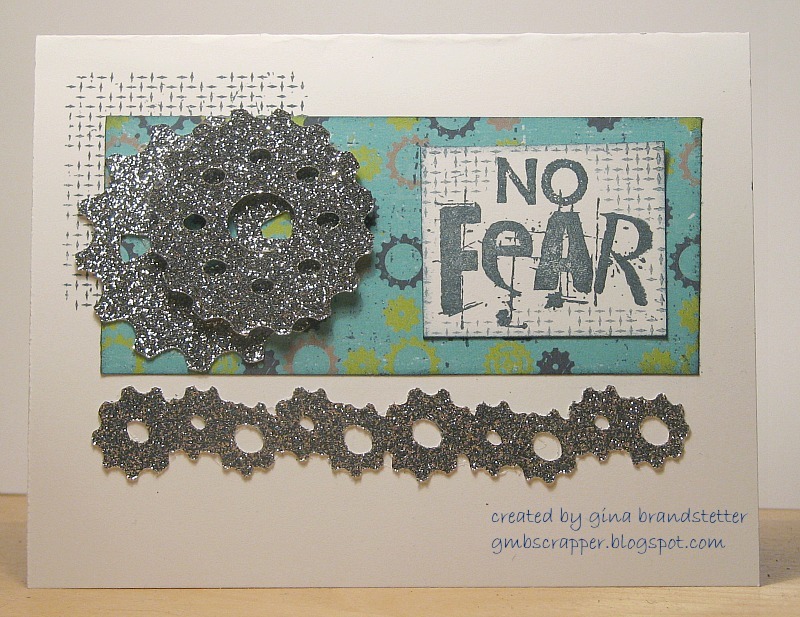 The background stamp and "No Fear" is from the stamp set that is exclusive to the Later Sk8r Workshop on the Go kit (G1057). When I finished the card I kept thinking it needed something else but I forced myself to stop. 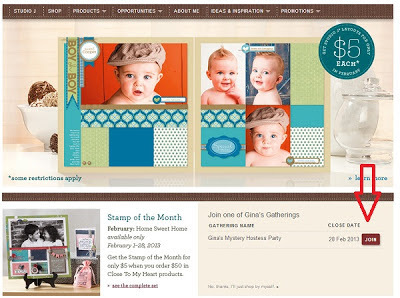 Friday is March 1st and that means another Stamp of the Month Blog hop! I hope to see you back on Friday! My actual card is pretty close to what I had 'created' in my dream state. I stamped the frames in Outdoor Denim and Twilight ink. This stamp perfectly coordinates with the Art Philosophy Cricut Cartridge - <circle 4>. I cut the inner circles at 1 3/4" on Chantilly paper using two different patterns. My card has faux stitching on the Twilight cardstock base. I used my ruler and paper piercer to evenly poke my 'stitching' holes. Next I used an Outdoor Denim marker to create my running stitch. I used Buttercup and Twilight ink on my butterflies from Flutter Paper Shapes (Z1463). The Happy Birthday sentiment is from the Joyful Birthday (B1419) set. It's one of my FAVORITE sets from the Spring Summer Idea Book! I finished the card with Colonial White Rosette Ribbon (Z1800) and Pearl Opaques Adhesive Gems (Z1336). Don't you just love it when you dream something creative?! I wish that would happen more often! You can order all of these products from my website! I have a Mystery Hostess Party going on now until February 28th! 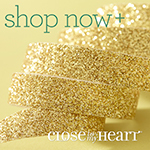 For every $25 you order, your name will be entered into a drawing for $20 in FREE Close to My Heart Products! 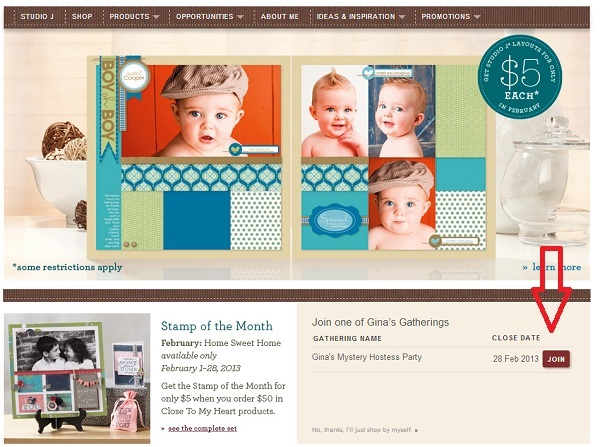 Just be sure to JOIN Gina's Mystery Hostess Party for your chance to win! A BIG WOOHOO TO MANDY! My very good friend and long time customer Mandy LaCroix was published in this month's issue of Paper Craft's Magazine! I was so excited for her. When I became a Close To My Heart Consultant back in 2006 Mandy was one of my first customers. I came to know Mandy at work because we worked together in the same group. 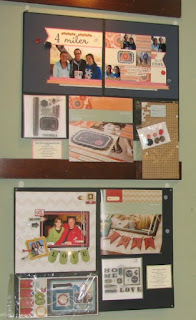 Mandy was and still is big scrapbooker but a few years ago I encouraged her to start making cards. Each morning when we would get to work we'd discuss what challenges were posted that day. The morning usually started with "OH - did you see....... or Have your checked........" I encouraged Mandy to start a blog to show off her work. So she started Scrappity-Doo-Da (what a cute name!) She has won many challenges. BTW..... We share a list of blogs we check each day. Sometimes we'll discover a new challenge and we'll add it to our check list. Mandy and I no longer work together, but we talk weekly - sometimes SEVERAL times a week. And we are always sending each other picture texts of what we create. Back in September Mandy called me. She was so excited I could hardly understand her at first. I said answered my phone and this is what I heard - "IHADTWOCARDSPICKEDUPBYPAPERCRAFS!" Yes - one big long run on sentence! She had TWO cards that got picked up by Paper Crafts! How AWESOME is that? Of course, we had to keep it on the down low until the issue came out. I just couldn't wait to share! If you have the 2013 March/April Paper Crafts, look for her cards - Page 31 - Just Ducky Card and Page 48 Giraffe For Baby Card. Here is just a PORTION of Mandy's card! 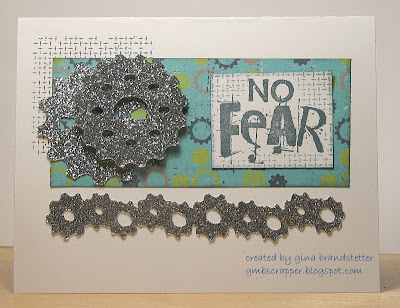 You will need to visit her blog to see the entire card and find out what stamps she used. I look forward to each of Mandy's posts. Her posts reflect her personality and I love reading them. Mandy is a busy mom of two and cherishes her time in her scrap room. Her attention to little details always inspires me. It's so great to have a wonderful friend that TOTALLY understands and shares my love of all things paper! While our kids and husbands don't understand our excitement when something comes together creatively or we squeal with excitement over an awesome new product, Mandy and I know we can get the crafty satisfaction we are looking for from each other! It's been a REALLY long time since I've created a baby card. 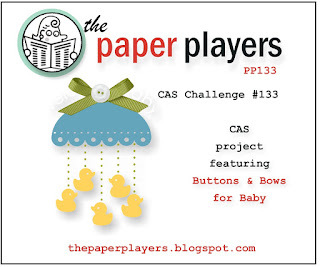 When I saw the challenge on The Paper Players to create a baby card with buttons and bows I thought it sounded fun! I have the new Chantilly textiles and have been anxious to do something with one of the fabrics. So, I pulled out the Buttercup pattern paper from the Chantilly paper pack and the pear print fabric from the textiles. I used the pear fabric on the edge of the buttercup pattern paper. For those of you that don't like to sew, I didn't use my sewing machine! I wanted to show how easy it is to add fabric without sewing! First I cut a strip of fabric 3/4" wide. Next, I used my ATG tape to add adhesive near the edge of the buttercup pattern. I placed the printed side of the fabric face down on top of the adhesive keeping the edges even. See photo above. When I got to a corner, I just turned the fabric keeping the edge even. After I went all the way around my square, I turned it over and applied adhesive to edge on the back. Turning the square back face up, I folded the fabric down and around the edge on the back where the adhesive is. I just had to work the corners a little bit to get it smooth. So NO-SEW easy! Thank you to everyone that took a little time out of a VERY COLD day to stop by my open house! I hope everyone had fun looking at the new products and browsing the new Close to My Heart Spring Summer Idea Book! This goodie bag is one of our new products - the My Creations Small Paper Pouch (Z1827). 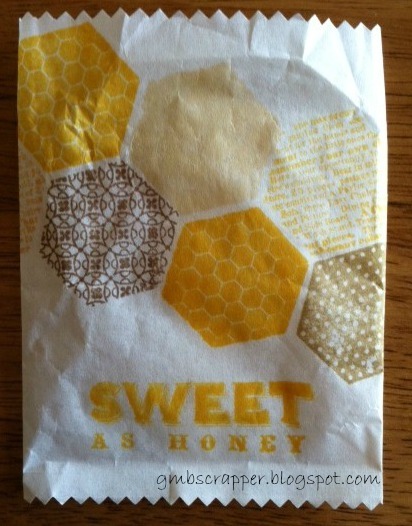 This paper bag measures 3x4 and is perfect little party treats! You get 20 little bags for just $2.95. I used the new Honeycomb stamp set (C1537) to stamp on the front. Want to see what treats were in my bag? Bit O' Honey candy, 2 brown flower buttons and an Acrylic Flower, also a coupon to redeem for FREE product! I used the Art Philosophy cricut cartridge to cut the tag for my coupon and stamped it with the set that is included with the Buzz & Bumble WOTG kit. 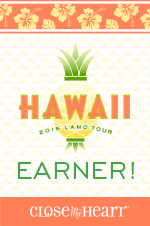 Everyone got tickets for coming, bringing a friend, participating in a scavenger hunt, purchasing clearance items and placing an order! They also got a ticket for each Operation Smile card that was purchased. The money for all cards sold is being donated to Operation Smile. A total of $74 was raised yesterday at my Open House for Operation Smile! I'm so excited about that! We used the Quick Card - Bumble Bee (A1135) stamp and Buzz & Bumble (X7164) paper accented with Hemp Twine and Chocolate Flowers. Throughout the day, I gave away a Petite Perk stamp. I think I gave away 4 or 5 of these little cuties! You had to be present to win one of these! If you missed stopping by, here are a few pictures of my displays. Remember! My Mystery Hostess party is still going on until February 28th! Join my Mystery Hostess Party and you will get a chance to win $20 in FREE Close To My Heart Products! One entry for every $25 you spend! 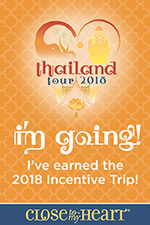 I will contact the winners by March 1. Close To My Heart's Spring Summer Idea Book was released February 1. Have you had a chance to look at it? If all the new products have your head spinning (like it did mine!) then you will love the inspiration you will get from this New Product Blog Hop! This hop should give you many great ideas on how you can use some of the new products. I guarantee you will be inspired! So, grab a cup of coffee or your favorite beverage, and a pen and paper to write down your wish list and hop on! It's going to be a fun ride! If you came here from Michele Loncar's blog you are on the right track! This hop is a big circle so when you get back to me, you have been all the way around! I love EVERYTHING about this new Idea book so deciding what I would share has been a difficult choice! But after much debate, I've decided to share the new My Creations Kraft Container featuring the Claire paper. These kraft containers are made of chipboard and stand 5 3/4" tall. They are 3" in diameter. This nifty little container can hold a gift, hide a treasure, or save some cash! For this Kraft container, I used the new Claire (X7166B) paper. 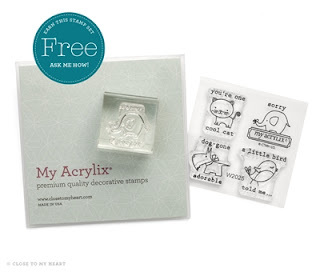 The stamp is from the Claire Workshop on the Go kit and is exclusive to that kit only. It is not sold separately. One thing I love about Close To My Heart paper, beside the great thickness, are the zip strips that are a part of the paper. Trim them off and they can be incorporated into your projects. I used one zip strip on the lid and the other I cut into short banners to hang from the side. See picture to left. Check out these fun new accessories! Outdoor Denim Chevron Ribbon (Z1808) looks great with the Claire paper as well as our new Tommy and Later Sk8r paper packs! Another favorite of mine from the Spring Summer Idea book is the new Wooden Mini Medley Accents Collection (Z1837)! I used the hemp baker's twine wrapping it around the container along with the Chevron ribbon and then clipped on a "FUN" clothespin! The new Durable Artisan Studs (Z1816) are the bomb! I love these adhesive backed studs and they come in two sizes for a total of 32 studs! These little studs are the center of my Floret Paper Shapes (Z1764). Ready for more NEW PRODUCT fun?? Hop over to Sheila Bennett's Blog and see what she has created for you! Don't forget! I've got a Mystery Hostess Party going on all month! Order from my website and JOIN my Mystery Hostess Party and your name will be entered in a drawing for $20 in FREE Close To My Heart product! 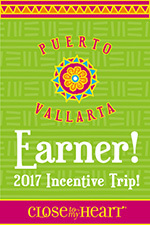 One entry for every $25 you spend! (pre-tax and shipping). Drawing will be held February 28th. Winners will be contacted for their choice in rewards! Are you like me? 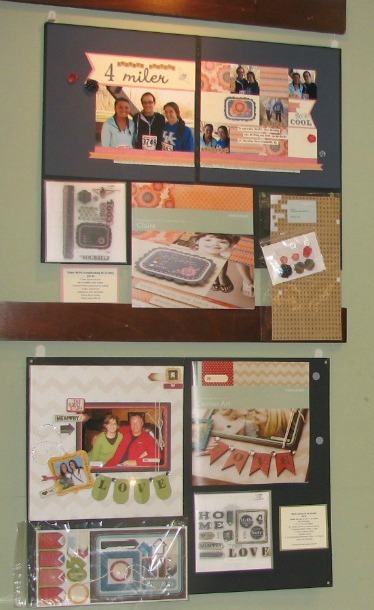 You hang onto each and every little piece of cardstock scrap? 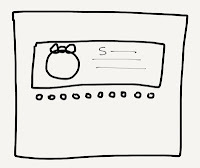 Even those 1/2" strips because they would be perfect for cards? Yes, I do that. I've searched and searched for the perfect container to organize my scraps. A couple of years ago, I had the perfect expanding file that held all of my scraps sorted by color. Until the day I broke the clasp off while loading it into my car for a crop night. After that I could never close it and it was hard to tote around. Check out the closure - yeah - that was in my way every time I wanted to go for a piece of pink or red cardstock. I had to go to the office supply store the other day to get printer ink. Whenever I'm there I never pass up the chance to look at their storage containers. I'm always on the prowl for something to solve this cardstock scrap hoarding err.... supply problem. On this particular day, Office Max had stacks and stacks of these plastic totes with lids that clamp on for just $8 bucks! They hold hanging file folders. I debated and debated for the longest time trying to decide whether I should get the smaller tote that holds 8 1/2 x 11 hanging file folders, or the larger tote that hold 8 1/2 x 14 hanging files. I do have alot of 12" strips! After crossing back and forth from one side of the store to the other (because they had one size on one side and the other size on the other!) I finally decided on the smaller tote because I didn't want a large tote taking up all the room under my table. (I have other things under my table for quick access.) It was a good choice because all of my 12" strips fit! Here is my new system! I love it and I'm so much happier! When I need a piece of cardstock I just grab the hanging file and I can open it up and easily find just the size I need! I cut and glued the colors of cardstock on the tabs so I'd know exactly which folder I need to look through. The great thing about this too is that it has a lid! There are handles on the side that latch up onto the lid and I can tote this anywhere I need to go! Be sure to come back on February 15th for our Close to My Heart NEW PRODUCT Blog Hop! Over 30 consultants are participating and you will get a wonderful sampling of ideas for many of our new products! Mark your calendar and I'll see you soon! MYSTERY HOSTESS PARTY going on now during the month of February!! Be sure the JOIN my Mystery Hostess Party going on all this month to celebrate the release of our new Spring Summer Idea Book! For each $25 you order (not including shipping and tax), your name will be added to a drawing for $20 in FREE Close To My Heart Products! Your order will be shipped right to you when you place the order! Drawing will be held February 28 and I will notify all the winners! My oldest daughter turns 23 on Saturday. She is now a beautiful young lady living on her own. We got her a Kuerig for her birthday and she was so excited! I never thought I'd see the day my 'little girl' would be excited about a coffee maker! WOW where did all the time go? I used this week's Mojo Monday sketch to create her birthday card. I knew all along that I would use our new For Always (X7165B) paper for her birthday card but I wanted to add a little color and thought this pink piece from the Chantilly (X7163B) paper pack was a great fit for the sketch and For Always. I used several new products on this card. Stamp is Perfect Fit - Frames 2 (D1536) and the little cake in the center is from the new Perfect Fit - Birthday (B1417) stamp. The birthday cake is mounted onto a circle punched from our new Black Glitter (Z1829) paper. I cut the 'perfect' shape for the frame with the Artiste Cricut Cartridge (Z1790). I added a bit of sparkle flourish from the new Sparkle Clear Flourishes - Small (Z1812). And how about my little fabric flower? The fabric is one of the new pieces of For Always Textiles (Z1820). The flower was easy to make. I cut a strip about 1 inch wide and folded it in half and pressed to get a crisp edge. Next I used a long running stitch along the open edge and pulled the thread to make a ruffle. I stitched the ends together and covered the center with a Rhinestone Brad (now retired). You can see this and many more new products at my Open House on Sat, February 16th! Drop by between 9am and noon. There will be door prizes, goodie bags, FREE Make & Take and more!